This past Friday I had the distinct privilege of attending a powerful Veterans Day Program. I have always enjoyed and been moved at these types of programs over the years. In fact, one the highlights of my time at Sherwood Christian Academy was participating in our annual Veterans Day Program. However, Friday’s event was one of the most moving Veterans Day Program I have ever attended. The reason why the program had such an impact on me was because of the men who planned, prepared and presented it. These men had spent many, many hours planning and putting together the program. In fact, on display were three tributes to veterans and their sacrificial service to the County. A full-size Willys jeep made out of two pallets of cardboard, 9 gallons of glue, and 3 gallons of paint. This work took over 750 man-hours and can actually hold a person weighing up to 200 lbs. 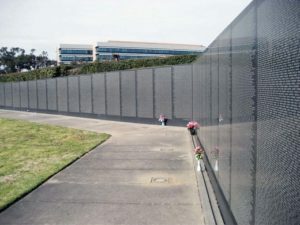 A detailed replica of the Vietnam War Memorial Wall; complete with the names of the 58,300 US military persons who lost their lives in this war. This project took over 9000 man-hours, 65 days, and over 3500 lbs. of cardboard. 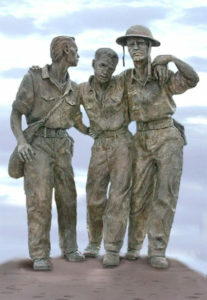 A life-size replica of the Bataan Death March Statue and Walkway. This project was also constructed out of cardboard and glue. It even shows the footprints beneath the three figures that represented those prisoners of war that died on the march. The theme for this Veterans Day Program was Never Forgotten and was a tribute to the more than 80,000 US P.O.W.s and M.I.A.s that still are unaccounted for today. This is probably the case in other countries where men and women have stood up for freedom and were taken into captivity. The audience was brought to tears through videos and songs that were performed live by this group of men. Several pieces, including the songs Never Forgotten, Freedom Flies, Memories and the poem, P.O.W./M/I.A., were written and performed by individuals in this group. I was literally blown-away by the sacrifice and talent that these men put into making this event so meaningful. This is because the program was held inside Walker State Prison and the men who presented the program were inmates there. 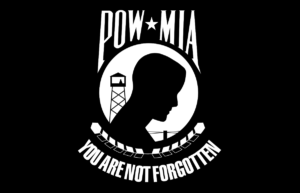 While inside the prison compound, I reflected on the reality that many people, including myself, have forgotten that there are so many P.O.W.s and M.I.A.s that are still unaccounted for from past wars. The theme, Never Forgotten, was not only a reminder that we cannot forget that men and women never returned home from war and no one knows where they might be but also that there are scores of men and women who are serving time in prisons all across the country whose friends and family members seem to have forgotten them and they are all alone. Since attending this event, my mind has been meditating on how important it is to remember certain things in life. Unfortunately, the educational systems of the world have led to many people, including thousands, if not millions, of Christians, to suffer from severe memory loss. Our children and youth are told that they must remember facts and pieces of knowledge in order to score well on tests, be accepted into the university and have a successful life or career. However, secular education does not place any importance on remembering the most important thing that every person must keep in the forefront of their minds in order to find peace and joy in all of life. What is the culture and the church not remembering that is so dangerous? It is the reality that we have forgotten God! When I began studying what God’s Word says about the dangers that come one’s way when he/she forgets God, I became aware of how important it is that God is at the center of all that we think, say and do; including the education we give our children. 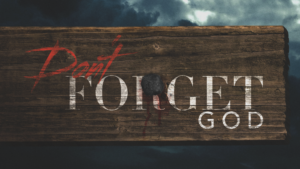 I encourage you to take the time and read what the Bible says about the consequences that will always result from forgetting God. Here is just a sample of what God’s Word says about this subject. Even though it is terrible when men and women become prisoners of war, it is much more disastrous when they become prisoners because of sin and are bond slaves of Satan. When people, even Christians, forget God, they always end up in chains. As I have presented in earlier posts, the real danger of giving our children and youth a secular education is found in the fact that God is ignored in the entire process. Therefore, even though certain lessons may be factually accurate, God is not seen as being the source of wisdom and knowledge for any study and/or area of life that is studied. The student develops a secular worldview and lives his/her everyday life as if God doesn’t exist. This always results in imprisonment. Here are some Scriptures to support this principle. Our children are asked to remember a lot of stuff throughout their years in school. Like you and me, they will forget much of it. However, we must do everything in our power to make sure that they never forget God. The best way to make sure this doesn’t happen, is for us to always remember Him. May God never be forgotten!